The MacKinnons are a branch of the great Siol Alpin, the descendants of Kenneth Mac Alpin who reigned in the 9th century. The Mac Kinnons on Arran give shelter to Robert the Bruce during his time as a fugitive, helping him make his escape to Carrick. After the king's victory at Bannockburn they were rewarded with land on Skye. A branch of the chiefly family became hereditary abbots of Iona. The last hereditary abbot was John Mac Kinnon, the 9th chief, who was also Bishop of the Isles. He died around 1500. The Scots kings since the reign of James IV had slowly undermined the power of the island chiefs. In 1606 James VI sent Lord Ochiltree to Mull to make proposals to the chiefs on his plans for government of the isles. When they disagreed with Ochiltree's plans, he seized the chiefs and imprisoned them is castles on the mainland. In 1609, Lachlan Mac Kinnon of that Ilk and other chiefs were forced to subscribe to the Statutes of Iona, which placed many restrictions upon their power. Despite this, the Mac Kinnons were loyal to the Stuarts, and fought in the army of Montrose at the Battle of Inverlochy in 1645. 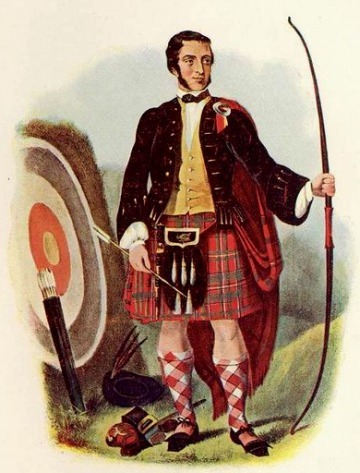 Their young chief, Lachlan Mor, was at the time in the custody of Argyll. In 1650, Lachlan raised a regiment which fought on the royalist side at the Battle of Worcester in 1651. The chief was created a knight baronet by Charles II on the field of battle. The clan remained loyal to the Stuarts in the next century, and sent 150 men to join the Earl of Mar at the Battle of Sheriffmuir in 1715. For this act the chief was declared forfeit for treason. The Mac Kinnons were also out during the Forty-five, marching to Edinburgh to join Prince Charles. They fought at Culloden, where the Stuarts' dreams of regaining their crown were crushed. The prince was sheltered by the Mac Kinnons in a cave, and Iain Og, who was over 70 years old, sent for his galley to take the prince to Mallaig, avoiding two Government warships on the way. He was less fortunate on the return voyage, however, and was captured in Morar. He was incarcerated in a prison ship at Tillbury, where he languished until 1750. When Ian Og died in 1756, his son, Charles, succeeded, but this line died out in 1808. In 1811, William Mac Kinnon, MP for Dunwich in England, matriculated arms in the Lyon Court, showing his descent from Daniel, second son of Lachlan Mor, who had emigrated to Antigua. The new chief was a prominent parliamentarian, and sat for 35 years. His second son, Sir William Mac Kinnon, served in the Grenadier Guards, becoming Director of Recruitment at the War Office during the First World War. The present chief is Sir William's granddaughter, Anne Mac Kinnon. A boar's head erased, argent, in the mouth a deer's shankbone, proper. Fortune assists the daring .